You are here: Home / Blog / Wattles Club teen room gets a makeover thanks to Aaron’s Inc.
Wattles Club teen room gets a makeover thanks to Aaron’s Inc. 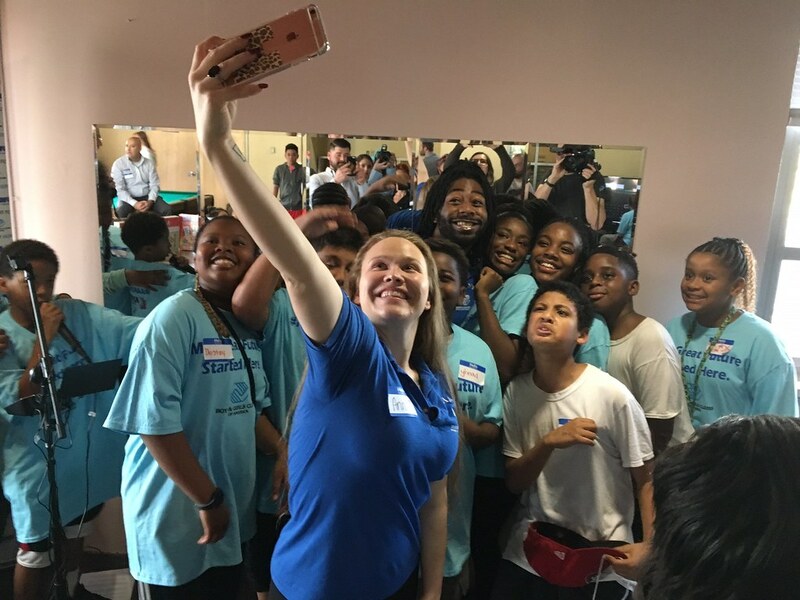 Teens at the Wattles Boy s& Girls Club were greeted with a freshly remodeled and upgraded teen room this Friday, thanks to a nationwide partnership with Aaron’s, Inc. The partnership, a $5 million, three-year commitment to BGCA, will support Keystone Club and teen programs in Clubs across the country. The Wattles Club teen room remodel is the 15h teen center that’s been completed under this partnership. Gifted with $27,000 in furniture, electronics, and appliances from Aaron’s, Inc., teens from the Wattles Boys & Girls Club worked alongside Aaron’s regional store managers to plan and design their newly refreshed Teen Center. The teens decided to “own” their teen center by designing their game zone, study space and lounge area where they can gather to learn leadership skills and enjoy a safe environment for study and recreation after school. Teens chose the special Sherwin-Williams™ paint colors for the rooms: Copen Blue; Pink Shadow; Peacock Plume; Pewter Tankard and Belvedere Cream. Aaron’s donated brand new computers and TVs, as well as painted and installed new furniture. Boys & Girls Clubs of America’s (BGCA) Keystone program provides resources and guidance that enables teens to build critical character and leadership skills. For over 50 years, Keystone Club teens have taken a leadership role in planning and implementing activities that focus on community service, academic success, career preparation, and teen outreach. In 2014, we began our partnership with BGCA and with our nearly 2,100 stores across the U.S. and Canada, and BGCA’s 4,000 Clubs serving 4 million youth across the nation, we believed that this partnership would reach thousands of teens in these communities. Boys & Girls Clubs of America is the number one youth-serving organization in the nation. Through Aaron’s sponsorship of BGCA’s Keystone program, the partnership empowers teens to develop their character and leadership skills and develop their path for success. The partnership promotes a culture of ownership for teens – taking an active role in their education and development to build their own great future. Together, BGCA and Aaron’s are opening doors for more teens in communities nationwide to attain success. The partnership provides support and resources to help reverse the negative trends facing today’s young adults and communities across the country. It puts teens in the driver’s seat to achieve their dreams and reach their full potential.